January 28, 2019 -- When you perform a 2D mammogram, breast density can mask underlying tumors. But when you use 3D mammography (or digital breast tomosynthesis [DBT]), you can more easily visualize breast anatomy slice by slice, and, subsequently, you may detect a true cancer. I first experienced DBT in 2016 with a Mammomat machine from Siemens Healthineers, and over the years, 3D has quickly becoming the standard of care. What 3D offers is the ability to see certain anomalies that just are not apparent on 2D screens. Further, sometimes a 2D image will show something suspicious, but when looking at the image in 3D, it ends up being an overlap of tissue and not a cause for concern. Such a situation creates a lot of anxiety for a woman who is called back for additional testing. She assumes it's cancer, but it might be a noncancerous or benign finding. Using 3D technology dramatically reduces the number of false alarms. 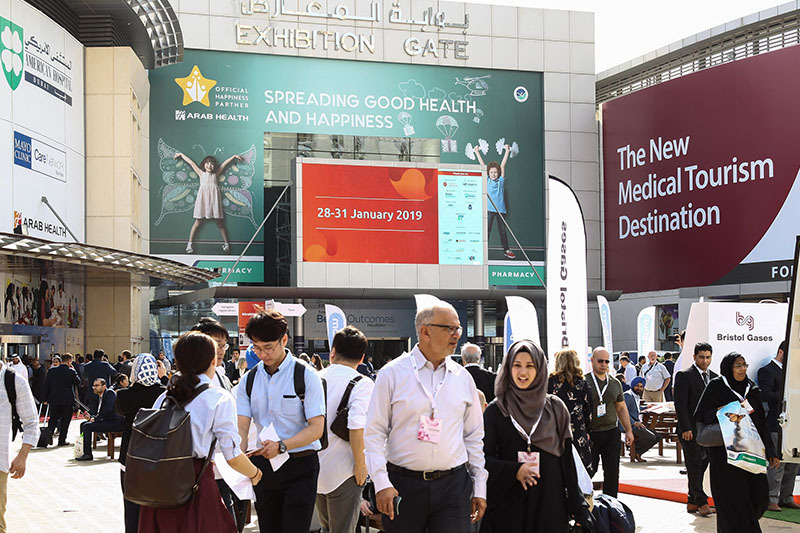 Around 84,000 attendees are expected at Arab Health 2019 in Dubai, United Arab Emirates. Image courtesy of arabhealthonline.com. Standard 2D digital images are provided even when 3D is used, giving physicians a complete picture of the breast, but 3D definitely has a clinical advantage. The 3D scan is an additional sweep that takes 1-mm slices through the breast, and it reveals the structure of the breast, allowing us to see more cancers. The 3D scan typically adds just one to two minutes more to the exam time. Research has also shown that cancer detection rates can be improved by 40% when 3D imaging is used in addition to 2D. That's because breast cancer outcomes notably improve the earlier the cancer is detected. The potential downside of 3D breast imaging is minimal. 3D scans do deliver a greater radiation dose than 2D scans, about the same as a conventional x-ray. The only time we don't perform 3D scans is because of patient preference or fatty parenchyma. The benefits of 3D definitely outweigh the downsides of it. As one of the newest technology available in mammography, 3D can have a huge clinical benefit, and we now have it readily available right here in our hospital. It improves accuracy and overall visualization for the physicians and provides greater peace of mind and reduced anxiety for patients. A 2016 study published by JAMA Oncology, "Effectiveness of digital breast tomosynthesis compared with digital mammography: Outcomes analysis from 3 years of breast cancer screening" (June 2016, Vol. 2:6, pp. 737-743), saw researchers analyze 44,468 screening mammograms of 23,958 women who had never been diagnosed with breast cancer. Interval cancers are cancers that are found within 12 months after a normal mammogram. Rates of interval cancers went down slightly from 0.7 per 1,000 women screened with 2D mammograms to 0.5 per 1,000 women screened with 3D mammograms. These results and other studies with exciting outcomes, along with my personal experience, show that 3D mammography has become an essential part of routine breast cancer screening. Dr. Nehad Kazim Albastaki is a specialist breast radiologist and head of breast imaging at Mediclinic in Abu Dhabi, United Arab Emirates. Editor's note: This is an edited version of an article that originally appeared in the opening edition of the Arab Health 2019 daily newspaper, published on 28 January. Dr. Albastaki was due to speak about "The role of digital breast tomosynthesis in clinical practice" on 28 January as part of the Total Radiology conference at Arab Health 2019.